Our special types of sealing brushes consist of 16 particular plastic profiles which we can supply in a comprehensive range of variations. 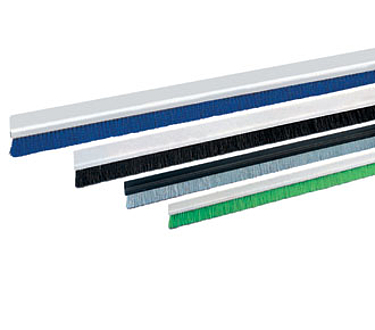 The two constructions of sealing brushes are:Strip brush construction: that means our strip brushes with metal backing are mounted in plastic profiles.Punched brush construction: consisting of a solid plastic profile with bundle holes in which the fill material has been mechanically anchored. Depending on the fill material you can choose a fill density of high EA1, medium EA2 or low EA3. We can also supply all sealing brush types with fixing holes in the holding flanges, e.g. 22 available sizes of round holes and 13 sizes of elongated holes. Standard lengths are usually 1000 mm or 2000 mm. On request lengths of up to 5000 mm can be supplied, depending on the type of profile. Of course we supply also all other lengths on request. All polyamid qualities have strong recovery properties. PA 6 is the cheap alternative for many applications.